Be sure to start dating checks 2017!! Boxing Day Clothing Collection continues this Sunday. We will be collecting blankets and clothing for the Friends of Seasonal and Service Workers. They accept any clean clothing in good condition for men, women and children. This includes warm clothing as well as clothing suitable for job interviews. Please contact Maggie Westerfield (mail4maggie@ymail.com) if you have any questions. Mary Sue’s Ava Hours are on hiatus this week. They will start again on January 4. December praxis: Give thanks for five things each day—small, large, in-between. See what expanded awareness of even small blessings does for you. The church office will be closed Monday for the New Year’s Holiday. VISITORS ALWAYS WELCOME! Bring a friend! Coffee hour in the narthex after church with Janet cookies. Cookies are shaped in the number 61 to honor Steve Todd’s birthday. Welcoming Tip of the week. Developing new friends and in-depth relationships keeps newcomers returning to your church. Studies show that many people stop attending a new church when they find that no one goes out of their way to befriend them. Our church is known to be very open and welcoming, but we need to take the next step and make sure newcomers are also invited to become part of our ministry. Instead of always asking the same people to help with something, invite a new person! Faith Formation Committee will meet Sunday, January 8 at 11:30 in the Youth Room. Newcomer classes called “Navigating the United Church of Christ” begin on Jan. 8th, 2017. 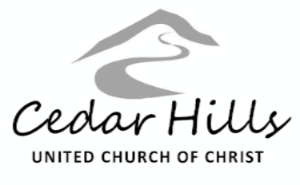 The series of four classes will give insights into the history, theology and inner workings of the UCC and the unique quirks of Cedar Hills UCC. Led by pastor Mary Sue Evers, the classes will follow the morning worship service on Jan. 8th and 15th and Feb. 12th and 19th. They last 75 minutes and a light lunch will be provided. Please RSVP to the church so we can plan food. Let us know about needs for childcare or special diets. office@chucc.org or 503-644-3838). The newcomer committee is calling for 30-40 outgoing volunteers! The bold, daring volunteers will look around for new people and offer to take them to the coffee hour. Then they will introduce them to others and see that they are heartily welcomed. (Former defensive football players would be especially qualified for this.) The first ten minutes after a church service are crucial for making visitors feel welcome. Willing participants, please contact Regina Ford, Chair of the Newcomer Committee, at regina.g.ford@gmail.com. Parent/Youth Mission trip meeting, January 22, 12:00, Youth Room. Youth Lock-in, February 3, 6:00 PM to February 4, 9:00 AM, in the Youth Room. KIDS’ CLUB begins January 22, 2017.
Who: All children aged 7 to 10 (approximately 3rd, 4th and 5th graders) and adults who would like to volunteer. What: Kids’ Club is a time to make friends, have fun, and learn about God through service to our community. Where: Gather in the youth room, just off Amistad Hall. When: Meet every 4th Sunday of the month starting January 22, 2017, from 11:30 to 12:30. CHUCC/Bethel Food Pantry (in the narthex bookcase) has requested canned pears and peaches, peanut or almond butter, and “kids’ food” like Chef Boyardee ravioli or spaghetti and meatballs. You may also donate money (check made out to Bethel UCC) to help Bethel buy food from the Oregon Food Bank. SHINE Backpacks for William Walker Elementary: Please put donated food in the basket as you enter the sanctuary. To donate money simply write Backpack Project on your check. Items needed: pasta, soup, vegetables, fruit, cereal or granola bars, tuna, beans, peanut butter and jelly (22 oz. plastic jar). Church Office Closed: Monday, for the New Year’s holiday. Spiritual Seekers Book Group: Mondays, 12:30-2:00, Duncombe. Meditation Circle: Tuesdays, 11:00-12:00, Brown Blackwell. Prayer Shawl Ministry: Tuesday, 1:00-3:00, Duncombe. Mission Team: Tuesday, 7:00-9:00, Duncombe. Men’s Group: Wednesday, 7:00-8:00 AM, Beaverton Black Bear Diner. Women’s Faith Exchange: Wednesday, 9:45-11:15, Brown Blackwell. Spiritual Partners: Wednesday, 11:30-1:00, Niebuhr. Member Care Committee: Wednesday, 1:00-2:00, Duncombe. Mary Sue’s Ava Hours Resume: Wednesday, 5:00-6:30, Ava Roasteria (near the Market of Choice on Barnes Rd.). Evening Meditation: Wednesdays, 7:00-8:00, Robinson (choir room). Contact Judy Beaudet for details. Theology Book Group: Thursdays, 1:30-3:00, Duncombe. Choir Rehearsal: Thursdays, 7:30-9:00 PM, Sanctuary. The Romos family, whose three-year-old daughter, Kiara, is home from the hospital and they are awaiting results of medical tests. Our Conference Minister Walter John Boris, who has announced his March 31 retirement, and the Central Pacific Conference, as we creatively move ahead. Eileen Elliott is suffering from severe back pain and a very bad cough; she welcomes your notes and calls. Lola Hinckley, home now but undergoing radiation therapy. Please continue to send cards to 6265 SW 208th Terrace, Beaverton 97078. Dan Boverman, recovering from a skiing accident. Glenda Wiley, recovering from a broken foot. Randy Baldschun, recovering from surgery after falling from a ladder. The Wadleigh family celebrates that David’s tumor has shrunk 60-70%, has not metastasized and he will have surgery in January. Thank you for all the prayers that contributed to this Christmas blessing. Please keep them coming. Ann Farley’s brother-in-law Patrick, undergoing chemotherapy..
Lois Binder, in very poor health. She can receive cards at 6238 Loma Lane, Madison, WI 53711. Those living with depression and other emotional and mental challenges. All who are caring for aging and ailing loved ones. Those who are dealing with long-term health issues: Sierra Archer, Karen Trogden, Heather Duffield, Ann Wiens, and Mary Townsend. Those unable to worship with us regularly: June Rogers, Fred Page, and Geoff Robillard. We remember those who have died in this past year and pray for all who mourn them . . . Rosemary Roy; Rebecca Carney’s mother; Sheila Thieme’s mother; Susan Helzer’s mother; Jean Sullivan’s mother; Martha Lynch’s brother; Tony Ard’s brother and Fran and Harold Ard’s son; John Maffitt’s sister; Bud Berri; Dan Corpron’s sister; Bill Wane; Hal Symons; John Maffitt’s brother–in–law; Myrtle Selof; Merle (Lois) Bryan; Marylou High; Polly Brown’s father; Donna Parsons’ sister; Ann Jordan’s father; Kathleen Coleman’s father; Judy Kraft; Lisa Ard’s father; Louise Pearson; and Larry Etter’s brother and father. Washington County MLK Day Celebration: What Happened to the Dream?, Sunday, January 15, 4:00, Southminster Presbyterian Church. Verna Bailey is the keynote speaker, with music by the Portland Peace Choir. Panel Discussion about Race, January 17, 7:00 PM, Southminster Presbyterian Church. The bible writes about angels in many places, and describes how they are here with us on earth, bring us messages, and intervene to protect us. We may never have an encounter with an angel, or not realize we did, but we know God sends them here to support and protect us. We may never know the things angels have done to influence events to protect us but we know that they can and do. Dear Lord, the angels are another mystery you have left for us to consider, we thank you for the promise of sending them to protect us when we acknowledge you. What an assurance it is to know they are here. In Jesus’ name we pray. Amen.